Giliam is a PhD student within the research group Architectural Theory & Methods. 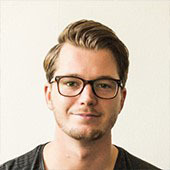 He is a product designer from the Netherlands and received his MSc degree in Integrated Product Design from the Technical University of Delft in 2015. Giliam works in the projects The Circular Kitchen (CIK) and FIWARE for Smart Energy Platform (FISMEP). Both projects aim to reduce waste and enable design solutions in the context of the home that reduce the use of energy and resources. The Circular Kitchen aims at developing interdisciplinary knowledge for more climate smart kitchen designs based on the circular economy concept, which will be co-created, tested and evaluated in practice in collaboration with a variety of industry partners.The FISMEP project, funded by ERA-Net Smart Energy Systems concerns smart grids and energy consumption in households.In his research, he uses research through design methods to explore design solutions for a circular economy, especially in the context of the kitchen and home. Furthermore, he aims to produce knowledge on circular design strategies and methods and on ‘how’ to design for a circular economy. There might be more projects where Giliam Dokter participates, but you have to be logged in as a Chalmers employee to see them.